Kennel "Kotmarian" Sharpei,Minipei,Flowerpei - Sharpei kennel "Kotmarian"
ДОБРО ПОЖАЛОВАТЬ НА САЙТ ПИТОМНИКА "КОТМАРИАН"
"Шарпей - это не смысл жизни, но благодаря ему жизнь обретает особый смысл "
WELCOME TO THE WEBSITE KENNEL "KOTMARIAN"
Нет в мире слова, которое могло бы выразить одновременно самоотверженность, преданность, ум, красоту и ласку - всеми этими великолепными качествами, обладает шарпей. Плюшевое счастье в складочку - во истину 7 Чудо Света! You can’t but agree that these wonderful creatures - dogs make our home a real home! We have been engaged in breeding dogs since 1987. 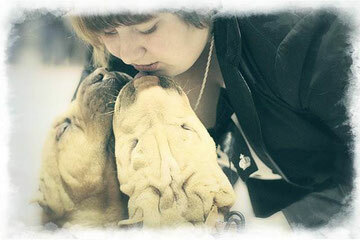 The sharpei kennel “Kotmarian” has been registered in FCI. We are known to select only healthy and beautiful individuals with sound psyche set-up. All our dogs are admitted to coupling only being in excellent health condition which is prior always proved by their veterinary certificate! All our dogs have splendid results in exhibition shows! All our sharpei have fascinating coats of various bright colorings. When coupling them we try to match such combination so that the next generation was still healthier and we could be proud of them! In our nursery you can buy a puppy, get a free consultation of a trainer, veterinary doctor and a breeder. Copyright. Any copying of information from the site, photos, pictures, video, must fit in with the owners of the kennel Kotmarian.